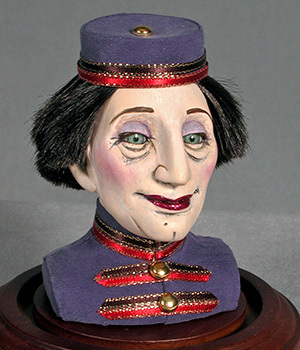 Chomick+Meder | "Percy, the Bellhop"
Hand painted Cernit, German glass eyes. Figure is wearing a violet blue bellhop uniform with red and burgundy metallic trim and gold buttons, hair is black 100% kanekalon synthetic material. The glass display base is made of real wood with dark walnut finish, base is grooved to hold glass dome in place.